The only one confused, Pete, is you... if historical revisionism can be called confusion. 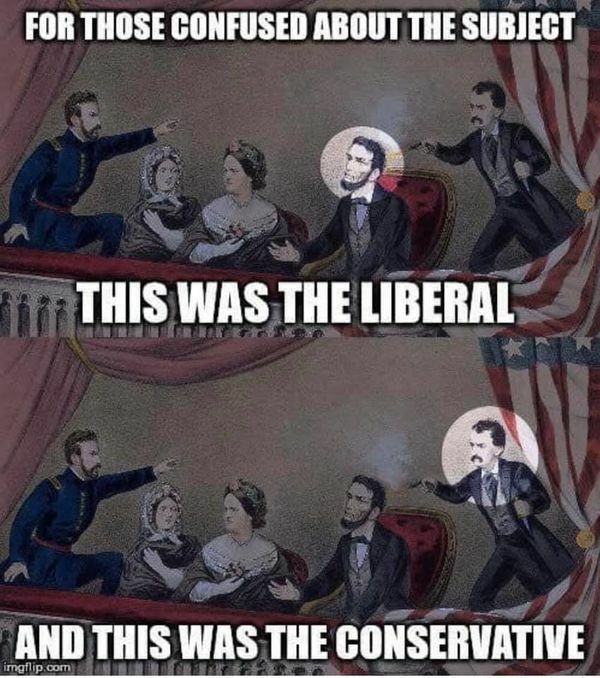 The fact is, Lincoln was a Republican, Booth was a Democrat. It was Republicans who attempted to end slavery. It was Republicans who stopped its spread. The KKK was an arm of the Democrat Party. I believe is was Strom Thurmond who said that it was not possible for person to be elected to the Democrat caucus in Washington unless he was a member of the KKK. Bill Clinton, in honoring him, stated the same except he said it was also a requirement for dog catcher, that to be elected to anything as a Democrat in those days, one had to be a member in good standing of the KKK. He is noted for making the longest filibuster in Congressional history. In 1957, he spoke for 24 hours and 18 minutes, expounding on the dangers of the Communist Civil Rights movement and the damage it was doing to the country. He remained a member of the KKK until he switched parties in 1964. If it is true that his membership in the KKK was nothing more than a pragmatic act, his switching parties would have been the same, an act of political convenience. All the way up to LBJ, Democrats fought equality legislation for African-Americans. The Liberal/Conservative fiction the Left has concocted in order to subvert the facts of history is as phony as everything else the Left pretends to believe in. Like Thurmond, Wallace and LBJ, whatever is convenient must be best answer. If you want to understand the difference between Liberals and Conservatives, in a nutshell, it is this; Conservatives seek to function within the law; Liberals seek to force the law to function as they desire. Thus, has it always been. Interesting conclusion, so voter caging is functioning within the law? Why is it that the courts didn't see it that way then? "Pursuant to the NVRA, a voter may not be removed from the voters list unless (1) the voter has requested removal; (2) state law requires removal by reason of criminal conviction or mental capacity; (3) the voter has confirmed in writing that he has moved outside the jurisdiction maintaining the specific voter list, or (4) the voter both (a) has failed to respond to a cancellation notice issued pursuant to the NVRA and (b) has not voted or appeared to vote in the two federal general elections following the date of notice." Voter caging may thus be legal if the primary purpose is to identify those who are not properly registered to vote and to prevent them from voting illegally but not if the primary purpose is to disenfranchise legitimately registered voters on the basis of a technicality. In January 2018, the U.S. Supreme Court heard oral arguments in Husted v. Randolph Institute, a legal challenge to Ohio voter caging laws. The Court upheld Ohio's list-maintenance practice in a 5–4 decision issued in June 2018. Because the law has certain requirements for voting and some people who shouldn't, try! Answer to part two, because the courts are packed with people who try to make the law function within their dimensions. Interesting, then how is it that prior to the switch, Democrats held the south and Republicans held the north and around the 60's it did a full 180? See the link I provided above if you really care... and it wasn't a switch. The short answer is that the regional demographics changed. A lot of business moved south and so did their employees. Section 8 of the National Voter Registration Act of 1993 (NVRA) has been interpreted to prohibit voter caging:". ""Pursuant to the NVRA, a voter may not be removed from the voters list unless (1) the voter has requested removal; (2) state law requires removal by reason of criminal conviction or mental capacity; (3) the voter has confirmed in writing that he has moved outside the jurisdiction maintaining the specific voter list, or (4) the voter both (a) has failed to respond to a cancellation notice issued pursuant to the NVRA and (b) has not voted or appeared to vote in the two federal general elections following the date of notice."" Yet the Republican party has several times tried to do this "voter caging" even though they knew full well that it was illegal. In 1981 and 1986, the Republican National Committee (RNC) sent out letters to African-American neighborhoods. When tens of thousands of them were returned undeliverable, the party successfully challenged the voters and had them deleted from voting rolls. The violation of the Voting Rights Act got the RNC taken to court by the Democratic National Committee (DNC). As a result of the case, the RNC entered a consent decree, which prohibited the party from engaging in anti-fraud initiatives that targeted minorities from conducting mail campaigns to "compile voter challenge lists." The RNC sent letters to predominantly-black neighborhoods in New Jersey in 1981. When 45,000 letters were returned as undeliverable, the committee compiled a challenge list to remove those voters from the rolls. The RNC then sent off-duty law enforcement officials to the polls and hung posters in heavily black neighborhoods warning that violating election laws is a crime. The effect was to suppress or intimidate black voters. In Louisiana in 1986, the RNC tried to have 31,000 voters, mostly black, removed from the rolls when a party mailer was returned. Again, the action was challenged and dismissed. The consent decrees that resulted prohibited the party from engaging in anti-fraud initiatives that target minorities or from conducting mail campaigns to "compile voter challenge lists." At whatever point registration in the state closes, a first class mailing should be sent to all new registrants as well as purged/inactive voters. This mailing should welcome the recipient to the voter rolls. It is important that a return address is clearly identifiable. Any mail returned as undeliverable for any reason, should be used to generate a list of problematic registrations. Poll watchers should have this list and be prepared to challenge anyone from this list attempting to vote. Shortly before the 2004 election, Palast also obtained a caging list for Jacksonville, Florida, which contained many blacks and registered Democrats. The list was attached to an email that a Florida Republican Party official was sending to RNC headquarters official Tim Griffin. The Republican National Committee also sent letters to minority areas in Cleveland, Ohio. When 35,000 letters were returned as undeliverable, the party employed poll watchers to challenge the voters' right to vote. Civil liberties groups challenged the RNC in a case that went to the Supreme Court, but the RNC was not stopped from challenging the voters. Similarly, the RNC sent out 130,000 letters to minority areas in mostly-black Philadelphia, Pennsylvania, and it hoped to cage voters there in the Democrat stronghold. Journalists have found evidence that the RNC had also attempted to use voter caging to suppress or intimidate voters in states such as New Mexico, Ohio, Florida, Nevada, and Pennsylvania. For example, New Jersey RNC officials used caging lists to challenge absentee ballots and absentee ballot requests. As noted earlier, the Republican Secretary of State in Michigan was found purging voters from voting rolls when voter ID cards were returned as undeliverable. In the court challenge, the federal judge ordered the state to reinstate the voters. The judge ruled that the state's actions were in violation of the NVRA. His decision noted that there was no way to prevent qualified voters from being disfranchised as their cards may be returned as undeliverable by postal error, clerical error, inadvertent routing within a multi-unit dwelling, or even simple misspelling or transposition of numbers in an address. In December 2007, Kansas Republican Chair Kris Kobach sent an email boasting that "to date, the Kansas GOP has identified and caged more voters in the last 11 months than the previous two years!" Republicans sent out fundraising mailers to voters in five Florida counties: Duval, Hillsborough, Collier, Miami-Dade and Escambia, with 'do not forward' on the letters. The mailers included inaccurate voter ID numbers and ostensibly confirmed with voters they were registered as Republican. The RNC declined to discuss the mailer with the St. Petersburg Times. A representative denied that the mailing had anything to do with caging. Two top Florida elections officials, both Republicans, faulted the Republican mailing, calling it "confusing" and "unfortunate" because of a potential to undermine voter confidence by making them question the accuracy of their registrations." Some officials expressed concern that the RNC would try to use a caging list derived from the mailers. In Northern California, reports of voter caging emerged when letters marked 'do not forward' were sent to Democrats with fake voter ID numbers. The description of the letters matches the letters that were sent out in Florida. See the caging letter that was sent out here. Many details on the letters were false; for example, the letters referred to a Voter Identification Division, but RNC personnel said they had no such department. The RNC did not return calls from a news organization regarding the letters. On October 5, 2008 the Republican (but elected on the Democratic ticket) Lieutenant Governor of Montana, John Bohlinger, accused the Montana Republican Party of vote caging to purge 6,000 voters from three counties that trend Democratic. The purges included decorated war veterans and active duty soldiers. Terri Lynn Land, the Secretary of State of Michigan, was found to be purging thousands of voters from voting rolls based on Voter ID cards being returned as undeliverable. The American Civil Liberties Union (ACLU) took Michigan to court over the purges. Judge Stephen J. Murphy ruled the purge illegal under the National Voter Registration Act (NVRA) of 1993 and directed Land to reinstate the affected voters. (See full ruling here ). The New York Times found in its review of state records that unlawful actions in six states led to widespread voter purges, which could have impacted the 2008 elections. Some of the actions were apparently the result of mistakes by the states in handling voter registrations and files as they tried to comply with a 2002 federal law related to running elections. Neither party was singled out, but because the Democratic Party registered more new voters this year, Democratic voters were more adversely affected by such actions of state officials. In the years since the original 1982 consent decree on voter caging, a series of suits and countersuits between the RNC and the DNC as well as civil rights groups and labor unions ensued. The RNC would attempt to have the consent decree lifted and other parties would attempt to have the decree enforced in specific cases in which the plaintiffs would allege the RNC was in violation of the decree. In November 2008, the RNC sought to have the consent decree lifted in the U.S. District Court in Newark (Republican National Committee v. Democratic National Committee). Judge Dickinson R. Debevoise rejected the effort, and his ruling was upheld by the Third US Circuit Court of Appeals. The Third Circuit ruling found, "It is not in the public interest to vacate the decree." It also stated, "If the RNC does not hope to engage in conduct that would violate the Decree, it is puzzling that the RNC is pursuing vacatur so vigorously notwithstanding the District Court's significant modifications to the Decree." The RNC then petitioned the Supreme Court of the United States to hear an appeal of the Third Circuit ruling; the Supreme Court declined to hear the case, leaving the Third Circuit ruling to stand as legally binding. "On October 26, 2016, the DNC filed a motion asking that the court find the RNC had violated the decree. On November 5, after abbreviated discovery, the district court denied the DNC’s request, ruling that the DNC had not provided sufficient evidence of coordination between the Trump campaign and the RNC on ballot-security operations, but will allow the DNC to offer further evidence after the election," according to the Brennan Center for Justice at New York University School of Law. Note: the case was thrown out due to insufficient evidence, that is not to say there wasn't evidence, just that it was deemed insufficient to fully support the claim. In 2016, Indiana came under lawsuit for using software to purge voters that was described as "99% inaccurate". Yes, I stand corrected, the Republican party would NEVER do ANYTHING illegal, especially over and over again. Voter registration lists, also called voter rolls, are the gateway to voting because a citizen typically cannot cast a vote that will count unless his or her name appears on the voter registration rolls. State and local officials regularly remove—or purge—citizens from voter rolls. In fact, 39 states and the District of Columbia reported purging more than 13 million voters from registration rolls between 2004 and 2006. Purges, if done properly, are a means to ensure that voter rolls are dependable, accurate, and up-to-date. Precise and carefully conducted purges can remove duplicate names and people who have moved, died, or are otherwise ineligible. Purging creates a problem when an eligible, registered citizen shows up to vote and discovers that his or her name has been removed from the voter list. Different states exercise very different practices as to how they maintain their voter rolls. Some critics of the process, such as the Brennan Center for Justice, maintain that sometimes the process is "shrouded in secrecy, prone to error and vulnerable to manipulation.